November 29, 2018 | Upper Peninsula of Michigan Radio - Yooper News, Interviews, Pictures, and Calendar of Events - Great Lakes Radio, Inc. Check out the details for Negaunee’s Tinseltown Celebration. 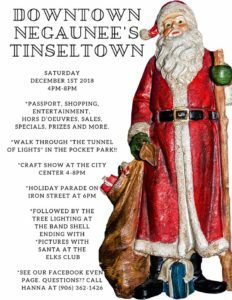 Negaunee, MI – November 29, 2018 – Don’t miss downtown Negaunee’s Tinseltown! Walk through “The Tunnel of Lights” in the Pocket Park. There will be a Craft Show from 4-8pm at the City Center and the holiday parade starts at 6pm on Iron Street! There will also be shopping, entertainment, refreshments and snacks, specials, prizes and more! Following the tree lighting, get pictures with Santa at the Elk’s Cub. We also will be providing the Tinseltown Passport again this year to allow Shoppers to have a chance to win custom gift baskets and give-away’s stocked full of gift certificates and goods from participating businesses. 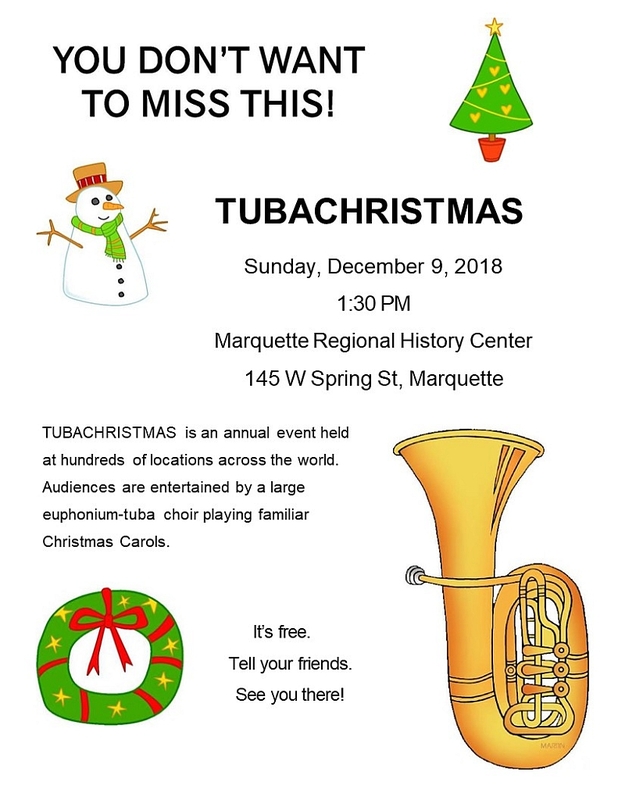 Marquette, MI – November 29, 2018 – Marquette’s annual TubaChristmas holiday concert will be held on Sunday, Dec 9 at 1:30 p.m. at the Marquette Regional History Center, 145 W. Spring St., Marquette. Tuba and euphonium players from around the area will perform Christmas carols in this annual tradition which is free and open to the public. TubaChristmas got its start with a concert on the ice rink at New York’s Rockefeller Plaza in 1974. 300 tuba and euphonium players congregated on that day to perform Christmas carols specially arranged by noted composer Alec Wilder. Since the inaugural concert, tuba and euphonium choirs have met annually in various locations to continue this event. This year over 300 cities across the United States and in several foreign countries will play the same arrangements as those performers 44 years ago. 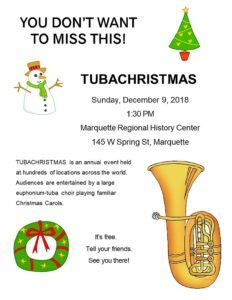 Marquette’s TubaChristmas got its start a bit more recently, but has rapidly established itself as an annual tradition. After instrument valves froze during one particularly cold December day, the Marquette Regional History Center graciously opened its doors to the group a few years ago and has hosted standing-room only crowds. Get there early if you want a chair. Again this year, it’s free, and it’s fun, and it’s at 1:30 PM at the Marquette Regional History Center on Sunday, Dec 9. Marquette, MI – November 29, 2018 – The Northern Center for Lifelong Learning will offer a presentation on Northern Michigan University’s medicinal plant chemistry program. Mark Paulsen, head of the NMU Department of Chemistry, will discuss the program, answer related questions, and lead an optional tour of the new lab that is under construction, from 1-3 pm on Thursday, December 13 in West Science room 2902. The registration deadline is Thursday, December 6. Paulsen will address the rationale for developing the program, along with the academic requirements, expectations and career options. The cost to attend is $3 for NCLL members and $6 for non-members. Register by calling 227-2979. For more information, contact event liaison Sandi Poindexter at 361-1820.